Usually, I write posts intended for my fellow vegans. However, as there are so many people in the UK that currently eat meat, I thought I’d try something a little different. This blog post is made for meat-eaters, but today we’re going to go into detail about chickens specifically. I was originally going to try and write about the experience of each animal in the meat industry in one post, but there was so much content for each that I felt it necessary to tell you about each one separately. This post is not intended to upset, but to inform. If you decide against veganism for you and your family, then you should at least be aware of the process that takes place before the meat you eat arrives at your dinner plate. I’m going to be focusing solely on ‘broiler’ chickens; these are chickens who are bred purely for meat. But, have no fear; we will be returning to the plight of the humble chicken on another day, to talk about eggs. We kill 750 million broiler chickens every year in the UK. Just to help put that number into perspective, there are around 66 million people living in the UK right now. Of the millions of chickens we slaughter each year, 5% of those are ‘free-range’ and 1% are ‘organic’, leaving 94% that are intensively reared. Today, we’re going to look into the way the 94% arrive at your dinner table. But, just for those of you that think that ‘free-range’ means cruelty-free; did you know that the RSPCA states that there can be up to 13 birds per square meter for chicken to be called ‘free-range’? That’s a fact that doesn’t quite fit with the picturesque scene of chickens roaming freely that we all imagined, does it? Anyway, back to that 94%. The average lifespan of a pet chicken is disputed; some live to between 3 or 4 years, whilst others last till a ripe old age of 8 or 9. The oldest recorded chicken, Matilda, lived to 16 years old, and managed to score herself a place in the Guinness Book of World Records for her extraordinarily long lifespan. Broiler chickens are slaughtered at between 6 and 7 weeks old. Between being born and slaughtered, broiler chickens are genetically manipulated to grow 65 times faster than they normally would, averaging at a weight of about 2.2kg in less than 6 weeks. As you can imagine, this rapid growth causes a number of health problems, from organ failure to crippling leg deformities. Many broilers physically cannot support their own weight, so they spend their short lives unable to move, or die before reaching the slaughterhouse as they can’t even reach their water nozzles. Their little baby hearts can’t support their adult size bodies, meaning heart attacks are also exceedingly common. So, for 94% of the chickens we eat, we allow them 6 or 7 weeks of life before they are slaughtered. During this short time, they are in agonising pain, packed by the thousands into overcrowded, filthy sheds, that are reportedly only cleaned every few years. At this point, all we can hope is that their slaughter is made as quick and painless as possible, right? Unfortunately, the reality is that broiler chickens are forced to endure even more suffering during their journey to the slaughterhouse. In the middle of the night, workers will enter the huge sheds that these chickens are stored in and corner them. In order to catch as many of them as possible in the shortest amount of time, they handle them roughly; grabbing them by their feet and stuffing them into crates. The broilers, who are terrified at this point, often suffer from broken legs and wings from struggling against their captors. Once the chickens are packed into crates, they are loaded into the transport trucks, ready for delivery to the slaughterhouse. This journey can take up to 12 hours; during which time they aren’t given any food or water, nor any protection from extreme weather conditions. Due to this, millions of broilers die before even making it to the slaughterhouse. The chickens that make it to the slaughterhouse alive can legally be left in crates for an additional 12 hours before being unloaded. Those that are too sick or injured at this point to be used for food, are dumped in mass graves and buried alive. Compassion Over Killing released video footage of this process after undergoing an investigation at a poultry farm. Don’t want to watch the video? That’s okay. Whether you watch the video or not, as long as you continue eating chicken, we can all assume that you’re totally fine with what happens anyway. For the lucky cluckers that didn’t die before they left for the slaughterhouse, on the journey to the slaughterhouse, or during a mass burial, more cruelty awaits. There are numerous ways broilers have been slaughtered over the years. There are decompression chambers, where chickens are loaded into a cylindrical chamber and the pressure is reduced continuously until the chickens suffer from ruptured ear drums, crushed lungs, convulsions, and eventually death. Or, if you’re looking for something a little more fast-paced, there are ‘kill cones’, where chickens are stuffed head first into a funnel, their heads are pulled through a small opening and their throats are slit while they hang, thrashing and screaming. In the UK, however, there are two main methods for slaughtering broilers: electrical stunning, and gas killing. The majority of poultry in the UK are now killed using gas. This is as simple as it sounds; they load crates full of chickens into gas chambers and expose them to a mixture of gas and air until they experience anoxia (loss of oxygen to the brain) and die. As there is no live shackling involved with this method, it is considered to be more ‘humane’ than electrical stunning. However, for the broilers that do not have the luxury of this ‘humane’ slaughter, they are destined to an exit far more brutal. The process of electrical stunning begins by shackling birds to a conveyor belt by their legs so they hang upside down while they are conscious. Once shackled, the conveyor belt moves the broilers to a ‘stunning’ water bath. The electrified bath is designed to stun the birds into unconsciousness once the conveyor dunks them into the water. However, this in itself comes with its own complications. Often, birds will raise their heads when entering the bath to avoid being fully immersed, meaning they will leave the water bath fully conscious. To combat this, workers are trained to decapitate the conscious bird as soon as they recognise it has not been sufficiently stunned. 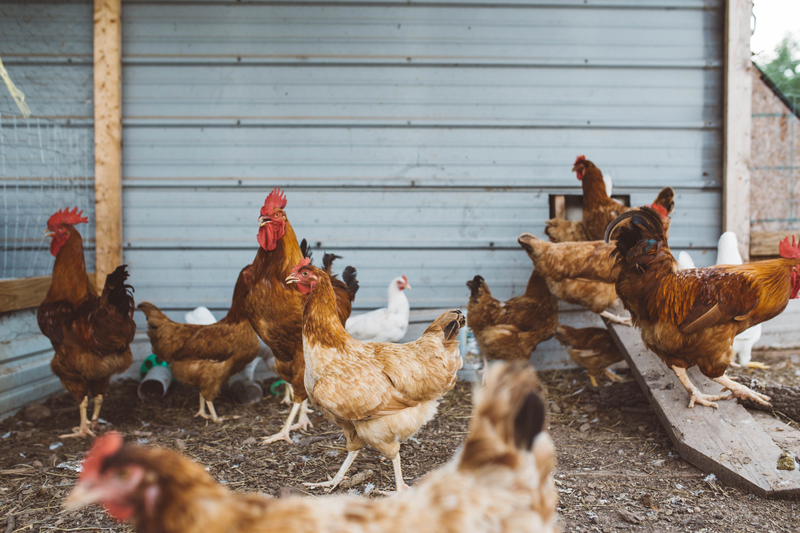 However, with a line speed of up to 9,000 birds an hour, many conscious broilers are missed, meaning the conveyor belt will continue to move them while they are fully aware and terrified. Even the birds who are stunned properly have been known to regain consciousness before being slaughtered, meaning that, overall, there is an unsettling number of conscious broilers that will move onto the neck-cutter. The mechanical neck-cutter is designed to sever the major blood vessels in the neck, allowing the blood to drain and the ‘unconscious’ broilers to die quickly. However, even if both cartoid arteries are severed, it takes about 3 minutes for a chicken to lose brain responsiveness from loss of blood. When you consider the number of birds that will have regained consciousness before having their necks slit, 3 minutes is an awful long time to endure this kind of suffering. It often takes even longer, as the conscious broilers will struggle in their shackles, meaning the neck-cutter can miss or not sever their arteries properly. The reality of electrical stunning is that there are a vast number of injured, terrified, bleeding chickens that will proceed to the final stage of slaughter whilst being fully aware of what is happening to them. Once the necks have been severed, the broilers will proceed to the scalding tank. This is where the chickens are submerged in tanks of 52 to 60°C (on average) water to help release their feathers from their skin without tearing it. However, Viva! estimated that over 8.4 million birds will enter the scalding tank while conscious, due to the neck-cutter insufficiently severing their arteries. Just to help you visualise what this is like for a broiler to endure, former slaughterhouse worker Virgil Butler reported that conscious birds ‘scream, kick, and their eyeballs pop out of their heads,’ upon entering the scalding tank. And that, ladies and gentleman, is only the initial horror behind the production of the chicken you buy in the supermarkets. If you’d like to see an example of what happens after the mass slaughter of millions of chickens, consider having a read of this undercover investigation of the production line of 2 Sisters Food Group, the company responsible for producing a third of all the poultry products consumed in the UK. Chickens are one of the most exploited animals in the industry, despite being intelligent, intuitive, and even capable of maternal behaviour. If you currently eat shop-bought chicken and want to help reduce the amount of suffering these animals endure, consider trying one of the many vegan meat substitutes currently available in your local supermarket. There are 750 million chickens that will thank you for it this year alone.